Have you thought about your beverage menu lately? Sure, it might not be as prominent as your food menu, but it’s just as important and contributes to your sales. The beverage side of your hospitality business has many challenges and opportunities to make your venue more profitable. Sales growth and profitability are two pieces of the puzzle. To design your beverage menu to achieve this requires a concerted effort to control costs and enhance sales. Here are some tips to help you do both. If it can't be seen then does it exist? Your menu should be easily visible to your customers. A passer-by should see it on your storefront, and customers should see it on the bar and on the tables. The same applies online, your menu should be on your website and available on your social media channels. Make it easy for your customers! Inside your venue, the menu should be easily left behind after guests have placed their original order. Leaving the menu behind (as opposed to your servers collecting it immediately) helps with up-selling and can lead to repeated orders, it’s an easy sales opportunity. Don't forget to also bring the beverage menu together with your food menu. Customers are likely to order their drinks with their food and not always separately. Long menus with too many items are not customer-friendly, so have a separate drink menu for the cocktails you want to showcase to help enhance sales. Keep the content specific but light so that it highlights interesting options without being overwhelming for customers. Before you start any campaign to increase sales or control costs, get a product sales report from your Point of Sales (POS) system to see what your top selling drinks are, and what the least popular ones are. This is your benchmark to grow from, it will help you determine where you need to beef up your beverage menu to improve sales. Let’s say 45% of your product sales is liquor and the rest is made up of wine and beer. Liquor often enjoys a much more favorable cost of sales - here is your opportunity. Create a cocktail menu with more premium products and a better profit margin. With this data, you can now think about your customers' preferences to keep them interested and motivated to try new drinks, and as a result, improve your sales with higher margins. Determine what your current focus (campaign) for your beverage menu will be. Is it beer, wine or cocktails? Whatever your campaign will be, keep it clear and simple! It’s best to feature a drinks menu with about a dozen of each category, i.e. either beer, wine or cocktails. A dozen cocktail features, a dozen wines, you get the idea. It helps maintain focus and makes it easier to upsell and ensure customers aren’t lost in an endlessly long menu. Plus, if you have too many drinks to choose from, your staff can't effectively upsell them. A drinks menu should have descriptions! We use all kinds of adjectives to embellish our food menus, why? Because it helps to sell. The same logic is there for your drinks menu, especially cocktails where you should be doing a little more than just listing ingredients. Use punchy words such as 'tangy', 'fresh', 'smooth' and 'robust' - it keeps your customers interested and makes it easier for your servers to sell your menu. Interesting names also work! Tie in some creative cocktails on theme nights with intriguing names to match. When done right this can effectively build up demand and ongoing customer interest, which can then encourage sales. Try these basic menu design techniques to help customers focus on the drinks and names, but not the prices. Don’t use dollar signs in front of the price, just a decimal point and never price anything on your menu as .00 always go for .95. The psychology of it is complex, overall, we perceive prices that end in .95 or even .97 as being more consumer friendly and more of a bargain. Nest your prices at the end of the menu item description. Customers breeze over it a little quicker and price becomes less of a determining factor in their purchase decision. This is true of all your menus; appetizers, beverages, and food. Menus must fit within the overall context of your venue. For example, if the vibe of your venue is swanky or sophisticated, design your menu to match your venue style. Again, if it has a more casual, pub feel, your menu design should reflect that. Try more playful designs (within reason) as an experiment and see what happens to your sales. Remember to print on high-quality paper that’s still easy and inexpensive to replace and reprint. Photocopy paper won’t cut it, neither will $5 sheets of overly fancy paper. Keep the message clear, don’t mix it up by being something that your business is not. It attracts attention and identifies best sellers. To make high-profit items more noticeable, create space around them by placing them in a box or separating them from the other menu items. By using negative space around an item, you can call more attention to it, making it easier to sell. For a similar effect, you can also make use of text larger than the regular font of your menu. Bold text, graphics, or illustrations help as well. Be strategic about what menu items you emphasize. The more often you do it, the less impact it will have. Choose only a few drinks per category (e.g. your signature drinks) to ensure the method remains effective and gives your customers more options. Alcoholic beverages are regularly divided into groups; liquor, wine, beer, and draft beer. The reason is simple, each of these groups have very different costs of sales within the total beverage category. Depending on your pricing strategies, liquor may have a cost of sales of around 23%, wine 50%, beer 33% and draft around 27%. If your beverage items are all grouped together and your total cost of sales on beverage was 37%, you would have no idea why or where to look for problems or opportunities. This grouping is something you should work on because if you are lax on controls in these areas, you won't be able to properly account for your items, or truly understand costs not just on your beverages, but your overall business. Grouping your beverages into liquor, wine and beer to get a better understanding of your cost of sales also applies to your sales. By keeping them grouped you can analyze and plan your beverage menu to manipulate sales. This is called sales mix. Knowing that liquor accounts for 20% of your beverage sales, wine 25%, beer 15% and draft beer the remaining 40% provides you with profound insights on what directions you can explore in your sales campaign while helping with cost control. To ensure that your beverage menu is profitable involves managing costs and growing sales. Improving these areas can impact the products you offer and promote to your customers, as well as your opportunities to increase sales and enhance your profitability. When you get this right, it’s likely that your beverage menu can be more than just an add-on. 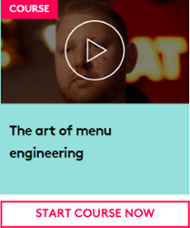 Start your Typsy online hospitality training to learn more about Menu Engineering with Ryan Gromfin. 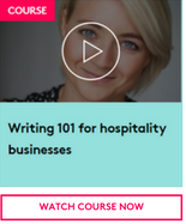 Watch course now!